The Fluke Warranty Plans provide ultimate equipment protection. Comprehensive programs provide routine and extended services, as needed. You can, of course, combine these options for any level of service. Protect your instrument with comprehensive calibration, extended warranty, repair, upgrades, and other support services. Maintain your thermal imager in top operating condition and control your cost of ownership with a Fluke Gold or Silver CarePlan. Choose between one, two or three years extended warranty coverage beyond your original factory warranty. 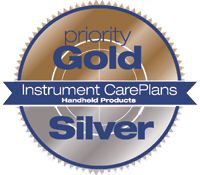 Protect your investment in your digital multimeter, temperature calibrator, ScopeMeter™ or other handheld instrument beyond its factory warranty with a Gold or Silver CarePlan. These comprehensive plans minimize downtime, and increase performance and accuracy. Lifetime is defined as seven years after Fluke discontinues manufacturing the product, but the warranty period shall be at least ten years from date of purchase. *(Lifetime Warranty applies to products manufactured after October 1996). The warranty does not cover manuals, fuses, disposable batteries, damage from neglect, misuse, contamination, alteration, accident or abnormal conditions of operation or handling, including failures caused by use outside of the product's specifications, or normal wear and tear of mechanical components. This warranty covers the original purchaser only and is not transferable. This warranty covers the LCD for 10 years only (state-of-the-art for LCDs). To establish original ownership proof of purchase is required (20, 70, 80, 170, 180 and 280 models). THE FOLLOWING PRODUCTS ARE INTENDED FOR SALE AND USE IN THE CHINESE AND HIGH GROWTH MARKETS ONLY AND AVAILABLE FOR WARRANTY PROTECTION ONLY IF SOLD, PURCHASED AND USED SOLELY FROM AN AUTHORIZED DISTRIBUTOR WITHIN THESE TERRITORIES: 101, 106, 107, 15B+, 17B+ and 18B+. THE WARRANTY FOR THESE PRODUCTS IS VOID IF THE PRODUCT IS SOLD, PURCHASED OR USED OUTSIDE OF THESE TERRITORIES, OR FROM UNAUTHORIZED DISTRIBUTORS AND NO WARRANTY COVERAGE, SERVICE, REPAIR OR REPLACEMENT WILL BE PROVIDED. Fluke Networks, Inc. warrants its products to be free from defects in material and workmanship under normal use and service for one year, beginning on the date of shipment. Most Link interface adapters, parts, product repairs, and services are warranted for ninety days. This warranty extends only to the original buyer or end-user customer of a Fluke Networks authorized reseller, and does not apply to manuals, fuses, disposable batteries, or to any product which, in Fluke Network's opinion, has been misused, altered, neglected, contaminated, or damaged by accident or abnormal conditions of operation or handling (All Fluke Network's products). Each Fluke product is warranted to be free from defects in material and workmanship under normal use and service. The warranty period is one year and begins on the date of shipment. Parts, product repairs and services are warranted for ninety days. This warranty extends only to the original buyer or end-user customer of a Fluke authorized reseller, and does not apply to manuals, fuses, disposable batteries or to any product which, in Fluke's opinion, has been misused etc. (55XX series, 57XX series, 58XX series and other FPM products). The Fluke Extended Warranty Plan provides ultimate equipment protection at an economical price. Comprehensive agreements provide routine calibration at regular intervals or repair service as needed. You can, of course, combine these options for full service coverage. This plan is an extension to your product warranty. Whenever your product needs repair or service, simply send it to one of the nearest Fluke Service Center. It will be repaired, recalibrated, and performance tested -- with priority scheduling. All parts and labor are included in the price of this service, even parts that are normally excluded from the Standard Price Service plan. So there won't be any surprises, even return freight costs are included. As you might expect, a Fluke Service Report and Certificate is enclosed with each repaired instrument. Contact your nearest Fluke Service Center for availability and complete terms of the extended warranty. If you need both scheduled calibration and periodic repair service, there is no better maintenance program for your equipment than our full service plan. It combines all the features of the Extended Warranty Repair into a single integrated full service plan. You pay a reasonable fee for each instrument and eliminate most additional service expenses. Contact us at 1-888-99-FLUKE (1-888-993-5853) or [email protected] for local availability and terms of this service. Before we can offer an Extended Warranty Plan: Instrument inspection may be required. This usually occurs when an instrument's warranty has expired. This Pre-Plan Inspection is performed during the calibration process and calibration charges will apply. Should the condition of the equipment preclude coverage we will provide a Labor and Materials Service quote for the repairs necessary to qualify your instrument. *Not applicable for all models. Fluke recognizes the importance of continued support services for discontinued products. Our policy is to provide support services for a specified minimum period after the product is discontinued from production. Please contact the Fluke Service Center for more information.